Dr Naila Arebi graduated as a Doctor of Medicine from the University of Malta. She pursued her post-graduate training in Oxford and London leading to accreditation in Gastroenterology and General Medicine in 2004 followed by advanced endoscopy training at St Mark's Hospital. She was awarded a PhD from Imperial College University of London, supported by the Helicobacter Parkside Study Group. She received the Sybil McMichael Bursary in 2000 and Travel scholarships to visit Medical University of South Carolina Endoscopy Unit and Kishiwada Tokusyukai Hospital and Osaka University Hospital, Japan. 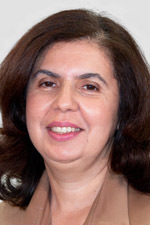 Following her appointment as a Consultant Gastroenterologist at St Mark's Hospital and an Honorary Senior Lecturer at Imperial College in 2005, she became a Fellow of the Royal College Physicians in 2010. Her clinical work involves most aspects of gastroenterology with key interest areas Inflammatory Bowel Disease, Irritable Bowel Syndrome and constipation. During her time as a consultant she set up the Bravo Catheterless pH monitoring service and leads the oesophageal diagnostic service. She currently holds the Chair of Gastroenterology for St Mark’s and through the award of NIHR grant she is the lead for a strategic IBD service improvement project. She is the director for two post-graduate courses: the speciality examination course in Gastroenterology and the St Mark’s Post-graduate Gastroenterology course. Her current research is focused on Inflammatory Bowel Disease, where she is the chief investigator on a number of research studies aimed at enhancing our understanding Inflammatory Bowel Disease, testing new treatments and improving the delivery care for patients through national and international collaborations with Chicago, New York and Denmark. She is a reviewer for a number of international journals and grant funding bodies and an author on several peer-reviewed publications. On a national level she sits on the British Society of Gastroenterology adolescents and young adults committee as elected committee member.